On the day before Memorial Day in the U.S., children in and around Montfaucon, France, lay more than 14,000 long stemmed red roses on the graves of American servicemen who gave their lives here in the final days of World War I. This is the site of the Meuse-Argonne Cemetery, the largest American burial ground on foreign soil. It is hallowed ground and a masterpiece of landscape design and gardening. 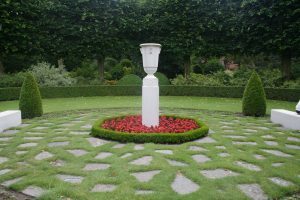 Among the beautiful gardens in Europe are those managed by the American Battle Monuments Commission, a federal agency formed in 1923, just five years after the end of World War I, to properly maintain the final resting places of soldiers and American civilians who lost their lives in service to the United States. Today there are 25 cemeteries and another 26 monuments or markers on foreign soil that honor this sacrifice of 124,905 American war dead interred in the cemeteries, plus 94,000 who are listed as missing in action or were buried at sea. The land for all cemeteries has been deeded to the U.S. Government in perpetuity at no charge. The ABMC employs 73 gardeners to maintain the meticulous landscapes, designed by French-born, Philadelphia architect Paul Phillipe Cret and overseen by General John Pershing, leader of the American Expeditionary Forces in Europe during World War I. The original plan for the eight World War I cemeteries in France, Belgium and England was void of flowers of any kind, instead focusing on both evergreen and deciduous trees and shrubs to create a distinctly American look in Europe. However, by the time work began in the 1930s, French and Belgian citizens living near the burial grounds had already planted a number of roses and other perennials at the American cemeteries. Not only would it have been a shame to destroy healthy, well-established flowerbeds, it would not have been a good community relations move. The first to be completed was the Flanders Field American Cemetery at Waregem, Belgium, a six-acre cemetery honoring 43 soldiers missing in action and 368 burials. The original planting list, precisely maintained today, includes linden, birch, elm, oak, Swiss poplar, flowering plum and weeping willow. 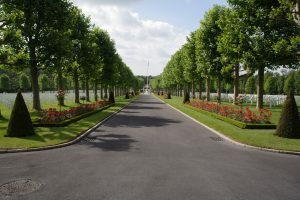 Square hedges of English yew, trimmed to 1.3 meters by .5 meters, are complemented by additional hedges of small leaf boxwood and dwarf boxwood with equally detailed trim specifications outlining the burial spaces. Hibernica yew, oval leaf privet and Irish ivy can also be found throughout the cemeteries. Mixed colors of standard roses fill various beds and pink and red climbing roses adorn the wrought-iron fences to the cemetery. Additional flowerbeds are filled with blood red wallflowers and a blue pansy border in the spring. Summer flowers include rose-colored geraniums and blue lobelia borders. 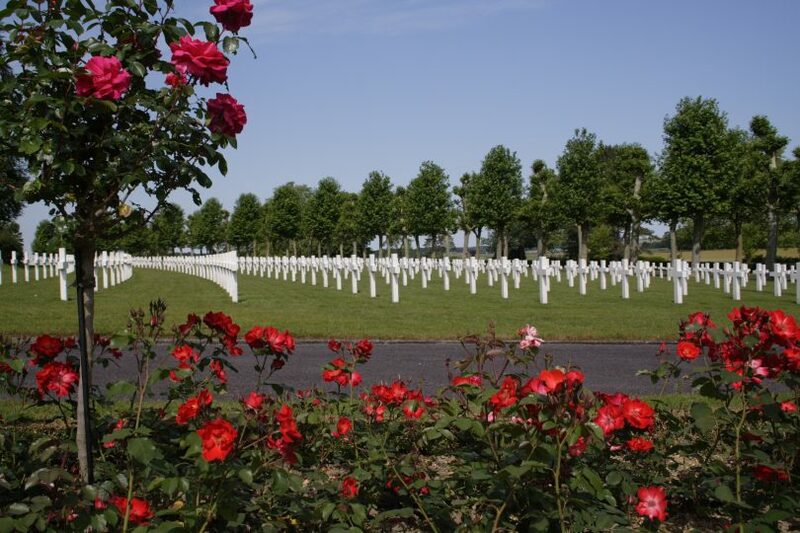 Although the size and design varies, these plantings are the basis of all American cemeteries on European soil. And of course, red poppies, the official flower of World War I based on the poem by Lt. John McCrae, can be found in paper or plastic forms around the gravesites and monuments, left by respectful citizens visiting from the around the world. So as the world commemorates the 100th anniversary of that “war to end all wars” and remembers the lives lost during those brutal four years of global conflict, we can also quietly give thanks for the efforts of so many volunteer and professional gardeners who keep their final resting places so beautiful. Diana Lambdin Meyer is a travel writer whose grandfather, Sgt. Wilbert Eastman, survived the trench warfare of World War I and came home to find peace in his own little garden in southern Illinois.